The Birth, and Baby Moon of Felix. 5th June 2017; 12.15am. The Birth, and Baby Moon of Felix. 5th June 2017; 12.15am. It was a mild Sunday. I had done 283 days of pregnancy…approximately 6792 hours (if the days didn’t sound long enough). I was 3 days overdue, the size and weight of a led balloon and I had absolutely reached my breaking point. For the past 2 weeks I’d had seemingly constant Braxton Hicks, awful back pain and every night ended in a false labour. I spent the day lying in bed crying, and coming to terms with the fact that I was obviously going to be an elephant forever. I had previously had two very rapid births, with my last being very traumatic, riddled with pre, and post-natal depression. 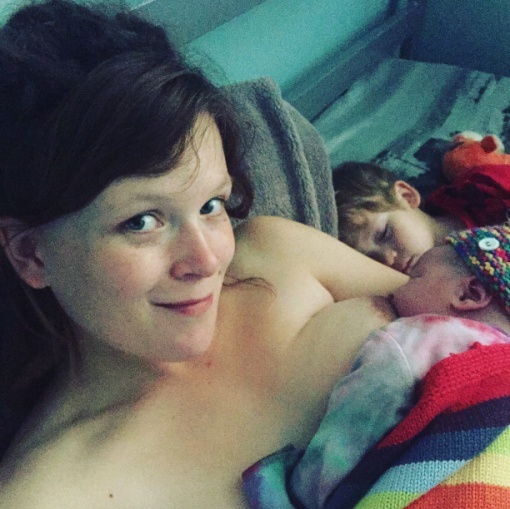 I was young, desperate for a home birth and felt completely ignored and not listened to by the NHS. I ended up in the midwife led unit at my nearest hospital being held down on my back to birth, which was not good considering I had SPD. 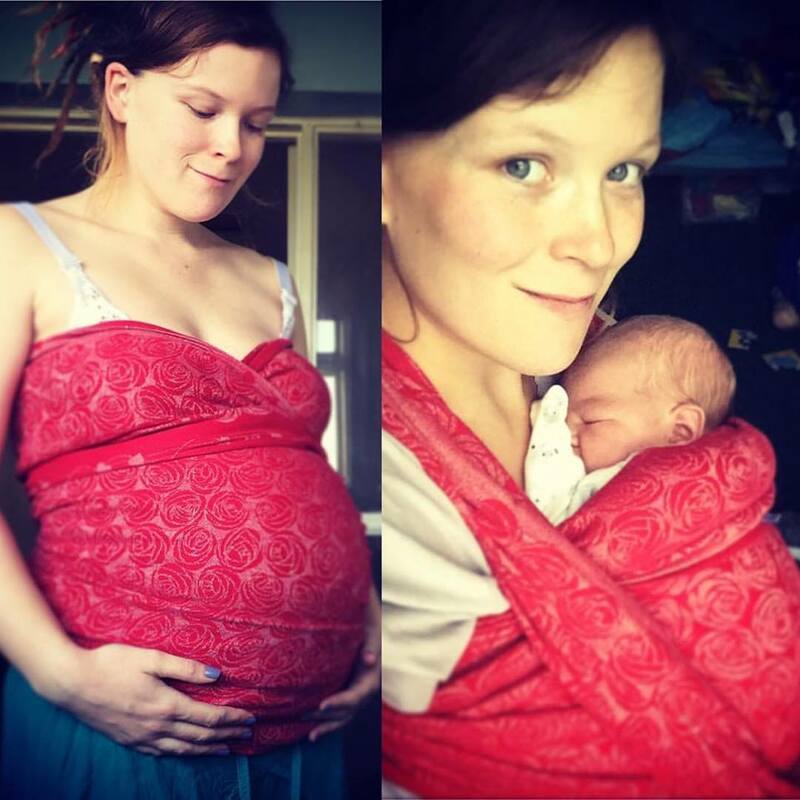 I thought I had dealt with the anxiety this experience had caused me; but until I fell pregnant again this time round, I had no idea how much I had locked away. I had a fantastic midwife for this pregnancy, who arranged a debrief with a lovely lady that gave me the confidence to be sure my wish for a home birth would be met. 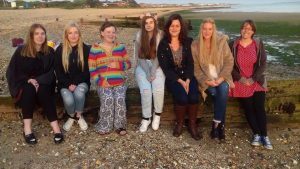 I had done endless sessions of hypnotherapy at home, printed off affirmation cards to stick to my wall, made a visual birth plan, practised my breathing techniques, watched calm home birth videos, had a pregnancy blessing with all of my most cherished female friends; and hired a fabulous doula to make sure that Ihad the best possible chance of achieving what I needed for myself and my baby. I spent the last few months being proud of my body, really coming to terms with my changing shape and loving it! However, those last two weeks of pregnancy really started to drain on all of this preparation and, to be honest, I was at the point of taking any offer made that would get this baby out of me. My doula came over Sunday afternoon to give this giant pregnant elephant a pep talk to help get me out of the headspace I had ended up in. 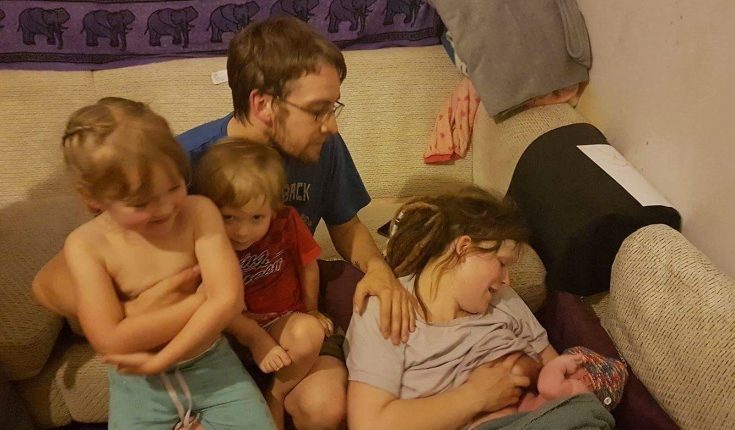 She said to spend the afternoon ‘pretending I wasn’t pregnant’; so we made plans to go the cinema the following day, and all sat down as a family to watch the One Love Manchester concert before bed. At around 7.45 the kids were settling when I suddenly felt a pop and my waters started gushing everywhere. 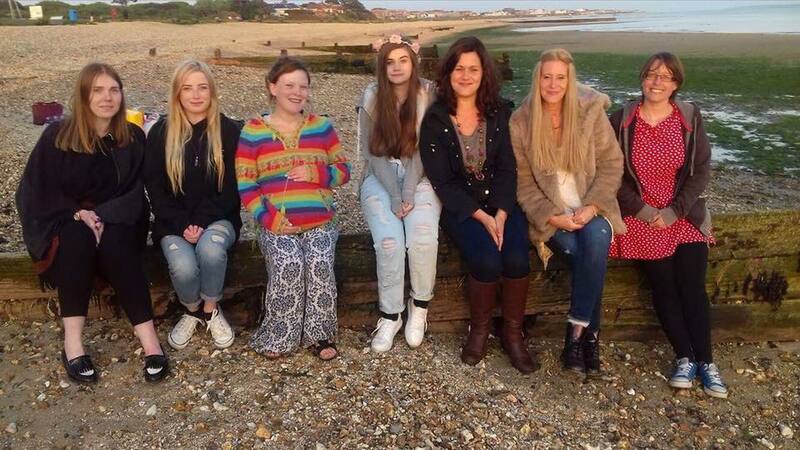 We phoned our doula to come back over, my mum and our birthing partners. Everyone arrived super quickly whilst I phoned the labour line to alert them that things were kicking off. They assured me that they’d send a midwife out as soon as my surges got to one in 6; they had one ready who knew the area really well so to phone back as soon as things became regular. After this, my doula did a sideline release; a technique from spinning babies, to get Felix in to a better position. By this point waters were literally covering my living room floor and sofa every time I moved; my once massive bump had deflated and completely changed shape, making us all think baby was going to be of average size. 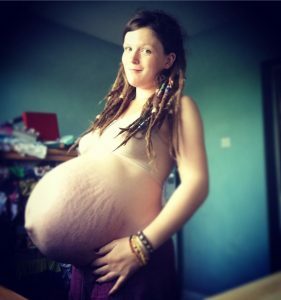 After some bouncing on my birthing ball and finding a chilled out music playlist; I went to the loo, which caused things to massively ramp up to the point I couldn’t get back upstairs without starting to make birthing noises. Daniel, my 3 year old; helped his dad massage my back whilst my doula helped keep my breathing steady and my mum phoned the midwife back. I was asked to go into the birthing unit, but in the throes of labour, I “politely” declined. By 11.30, things had massively ramped up, and it was obvious that Felix was well on his way. 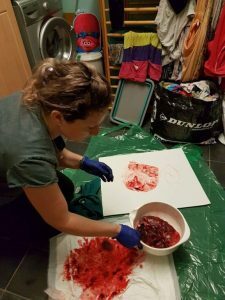 I made my way to the air bed we had prepared, whilst my doula held my pelvis and a paramedic was phoned. I could feel Felix moving up and down the birth canal with every surge. The intensity was beyond my ability to describe! Hannah, my 5 year old was awoken by the commotion and came in to watch on in fascination. 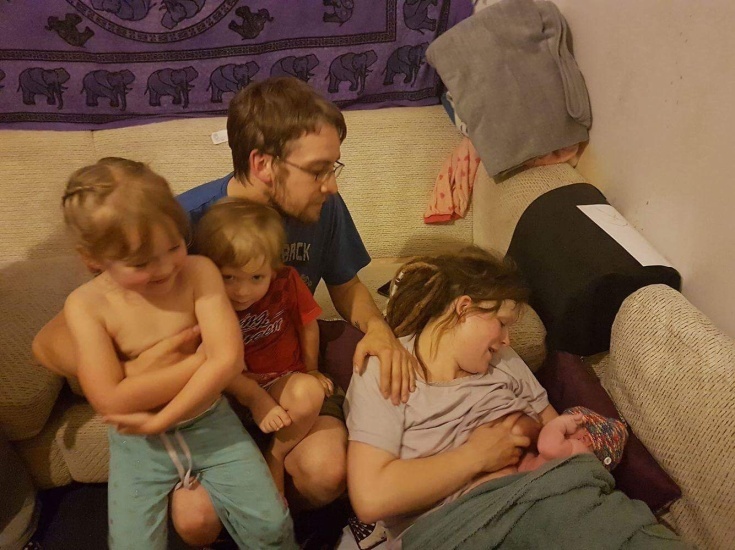 We had prepared both the children beforehand with lots of conversations about what would happen, along with lots of home birth videos on YouTube; so they knew what was going to happen. In just 2 minutes, at 12.15am; Felix was born! The paramedic walked in as his head was born. She was wonderful and completely respected my choice to be observed from a distance. Not long after Felix landed on the airbed; the midwives walked in. I birthed on all fours so leant back to pick up my beautiful, and huge, baby boy. I was the first to touch him, which was magical! 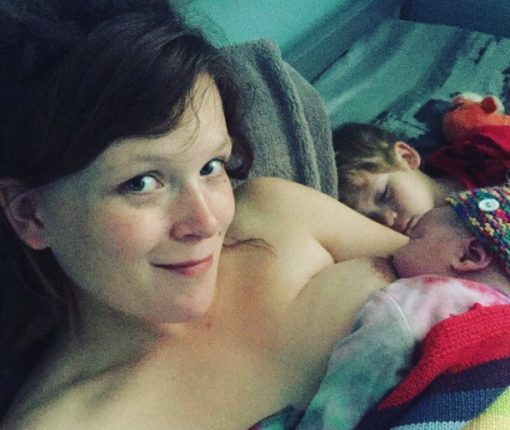 We had some skin to skin; then he latched on and fed until the placenta was delivered naturally at 12.45am. The cord wasn’t touched until this point, by which time Felix had got the full amount of goodness from it, and it had turned white. His dad then helped to cut it, with the kids watching on, still in complete fascination. My doula helped me tie his rainbow cord tie on, and then he was weighed. 10lbs5. TEN POUNDS FIVE OUNCES! The entire room erupted in a mixture of shock and humour at the fact that me, only 5’4 in height, had naturally delivered this giant child without even a taste of a paracetamol, in 2 minutes with not even a graze. Whilst Felix was dressed and his siblings got their first cuddles, my placenta was checked over and taken by my doula for some prints and a placenta smoothie. The smoothie was blended with red berries and apple juice; it was so refreshing to drink after going through birth and completely stopped my shakes and helped to reset me. 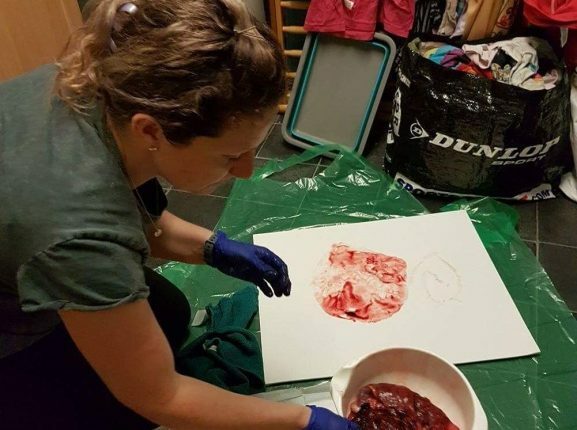 My placenta prints were done as with my last two, I never even got asked if I wanted to see the placenta. The tissue that had helped to nurture and grow my babies was whisked away like it was something dirty; so this time, I wanted a reminder of what my amazing body had held and grown that I could put some artistic flair on. Once everything had settled, and Felix had been checked over. Everyone headed home and we settled down for bed, at 5am Monday morning. The whole experience was so surreal I couldn’t sleep from the high and excitement. I had finally got the birth I had been dreaming of. Everything about it was beautiful and wonderful. In these days, I had the time to do a lot of reflection on myself, and past experiences not only involving birth, but of life in general. I realised that I’ve spent way too much time trying to be perfect at everything, and too much time being afraid to ask for help; two valuable life lessons that will forever stay with me.